We’ve all been there, ammies and pros alike, the must-do’s get in the way of the riding we wish we could be doing. And I had a BIG must-do in June which stretched into July — moving my internet retail company’s 6000+sqft warehouse. This is no small task on a good day, but in June, in Texas, it’s a monster. Skipping the gory details, I’ll just hop to the part where I did not ride for FIVE WEEKS! Yes, you read right – FIVE WEEKS. In fact, I only saw my lovely steed three times during that period. This is where a top-notch boarding barn (Snowdonia Farms) and trainer (Jayne Lloyd) can make life so, so much easier. Now, I didn’t realize just HOW much easier until I finally hopped back into the saddle two weeks ago, just in time to prep for our barn’s schooling show that weekend. 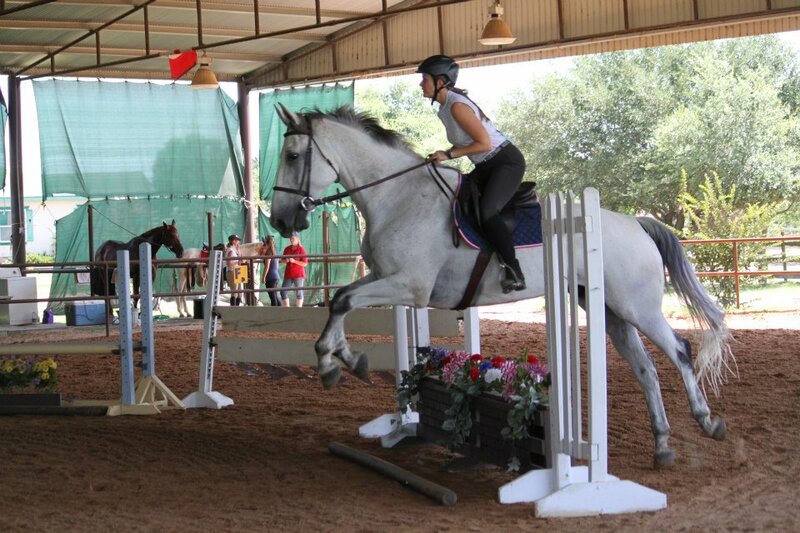 A note — those who have read earlier posts already know this, but for newbies to the blog, my horse Mr. Big (Buddy) is big. Really big. And green. And opinionated. So naturally I laughed as I climbed on board — not likely that I’d be showing that weekend or anytime soon, but one can hope. So I moved him out and worked through our warmup. Hmmm, not bad. Picked up a marvelous walk to canter transition and was doing 15m circles (balanced and uphill) by the end of Day 1. By back-to-riding Day 3, I was navigating a low jumper course with nary a waver – and not a hint of our “backside buck” that “Mr-I-hate-being-dropped-on-the-back-side” has made into an artform. So I showed that weekend. We opted for Green Hunters instead of jumpers (hey, I’m not crazy! ), and we did great, clean and consistent in all rounds — with clean changes — a first! In fact, looking at the pics, I think Mr. Big needs a bit more of a challenge going forward — seriously, he’s landing and taking off over a 2’3″ in the same step! Overall, I was stunned that in just four days back after five weeks off, riding was as good, maybe even better, than where I left off. I think we’re finally ready to handle a move up. So — was it a needed break? Maybe, but I’ll chalk it up to a solid month of rides by my awesome trainer without my 3x a week interference. Oh, the difference a good trainer can make!! !